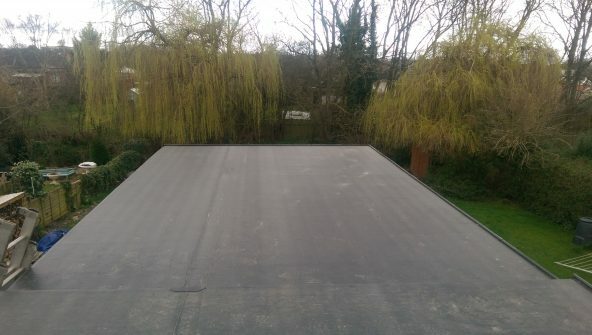 SUMMARY: A good example of the application of RubberBond Fleeceback EPDM in a residential installation. This privately owned home is an unassuming suburban terraced house situated in Bramley Garth, York. 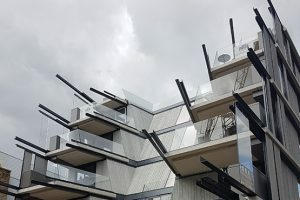 The owner was expanding his home and added a single storey extension to the existing building which required a 100m2 flat roof. Chris Clint Building & Joinery, a new RubberBond EPDM approved roofing contractor, was looking for a flat roofing solution that was easy to install, good quality and would last for many years, whilst providing the home owner with a beautifully finished roof and the assurance of a professional outcome because RubberBond EPDM can only be installed by trained and approved contractors. 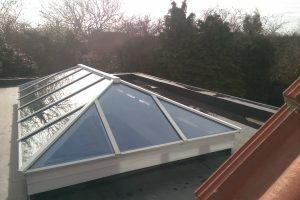 The house had a single storey cold roof extension which required a roof covering that kept the roof watertight and provided a durable finish that would need little or no maintenance for years to come. 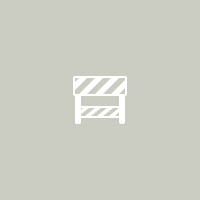 RubberBond EPDM was chosen for the job due to its excellent durability, high quality appearance and the speed of installation; all for a relatively low investment. When the roof was finished, it blended in perfectly with the original roof as well as the neighbouring properties. 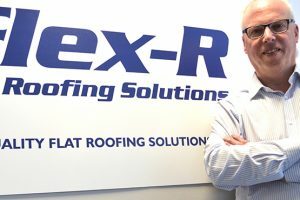 As this was the contractor’s first EPDM installation, Graham Matthews from the Flex-R technical team was on hand to provide on-site assistance and support, giving Chris Clint Roofing total peace of mind and the skills necessary to install the RubberBond EPDM effectively. 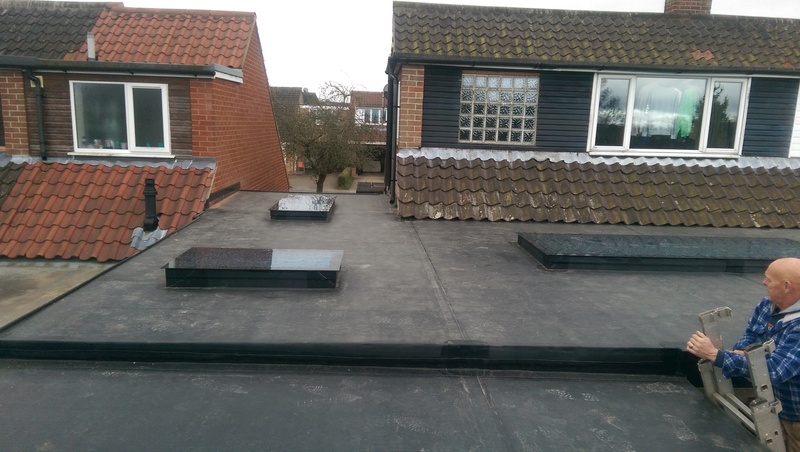 RubberBond EPDM was installed over 18mm OSB3 using a water based adhesive. For the more complex areas of the roof where crisp corners and intricate detailing were required, a solvent based contact adhesive was used. To obtain a strong and seamless finish the adhesive is applied to the substrate and the reverse of the membrane and then allowed to ‘flash off’ so when the two surfaces are placed together, an instant ‘grab’ is achieved. 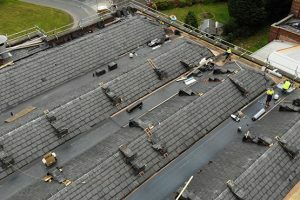 Using the correct adhesive at each stage of the installation ensures the best possible roofing finish. 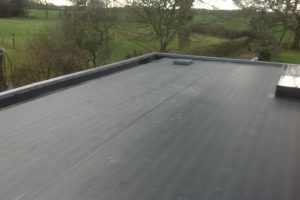 To complete the installation, the roof perimeters were finished using SureEdge PVC trims which give a beautiful and professional end result. By choosing RubberBond EPDM, the homeowner is assured of a high quality outcome that will change little in its appearance over its lifespan. The contemporary seamless finish achieved will look as good in the future, as it does on the day it has been installed. 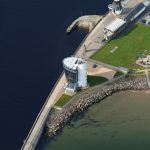 This is because RubberBond EPDM has BBA certification which states that under normal service conditions, the system will provide a durable waterproof covering with a service life of at least 35 years. 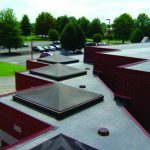 RubberBond EPDM achieves this certification because it provides unmatched weatherability; it is UV stable and will not suffer from cracking or crazing over time. 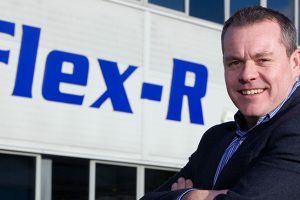 Flex-R’s technical support ensured that the project was completed on time and in budget and the homeowner was particularly impressed with the outcome, he said “the rainwater just runs off the roof, it looks brilliant”.